Genesis Systems Group is a leader in the design, installation and integration of robotic systems. 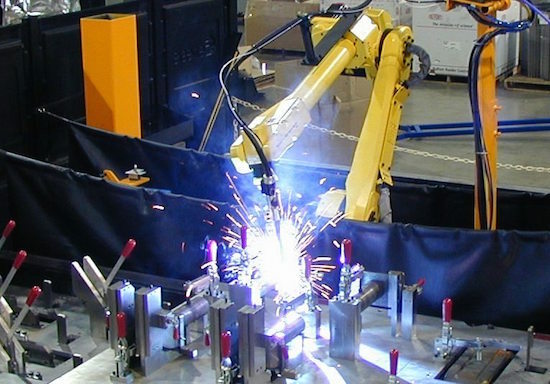 Since 1983, Genesis has specialized in factory automation by providing robots for welding, cutting, inspection, adhesive application, material handling and more. Their expertise is centered on the design, manufacture and implementation of systems for welded assemblies, mechanical assembly, handling and tending, non-destructive inspection, abrasive waterjet cutting and material finishing. Robotic systems are changing the way manufacturers operate by helping to reduce errors, increase output, and minimize downtime. Unlike their human counterparts, robots can perform repetitive tasks day in and day out without error. They can work non-stop, 24 hours a day, and they can dramatically increase the profitability of your business. Genesis robots can be found worldwide producing a variety of parts for a wide range of industries. If you’re interested in learning more about robotic systems by Genesis, please contact us today to request a consultation.